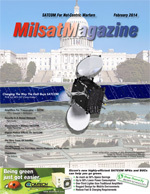 Congressman Mike D. Rogers (R-AL) recently published an article entitled, “Changing the Military’s Approach to Commercial Satellite Communications,” and it was refreshing to see a leading member of the House Armed Services Committee seriously addressing an important if somewhat obscure issue. Over the past several years, Communications & Power Industries LLC (CPI) has manufactured many products for use in Beyond Line of Sight (BLOS) and Communications on the Move (COTM) applications. The need for security is always paramount in military networks. This is especially true for satellite networks where data is broadcast over an area the size of a continent. With the raft of bad news from recent earning calls stating lower government revenues in the satellite industry, one has to ask the question: Is a pessimistic view of the market fair when the changes coming will grow the market pie and offer more bits-per-hertz at a cheaper unit price. One of the most highly anticipated events for 2014 is the full withdrawal of U.S. and allied troops from Afghanistan. The drawdown that began in 2011 has led to diminishing growth in the global land mobile satcom market given the lower number of troops, vehicles and other assets that needed to be supported by a variety of satellite-based solutions. The French have a tradition that is, depending on your point of view, either charming or sexist. They personify the French state—in particular its ideals of “Liberté, Egalité, Fraternité”—in the form of a woman. Well, not exactly, of course, but the metaphor from the 1990s book about relationship problems is within the universe of apt descriptions for separate development paths often taken by payload owners and satellite operators.